“We spend more time talking about our relationship than we do actually having one.” He blurted out from across the picnic table with wind snuffed candles and half eaten chicken. He was right. It bugged me but the truth was right there. We had met under strange circumstances and kept seeing each other without a sense of direction or purpose. What I do know is we both wanted something deeper. It just wasn’t the same something and the only thing we had in common was our similar past that we were both trying to leave behind. That evening I’d attempted to fan what ever flame might be there. A picnic dinner, local park at sunset face to face with each other. What came of it was the stark realization that neither one of us were feeding the relationship. We weren’t actually having one, we just talked about one. I’m beginning to see social media in the same light. We try to share our lives, our politics and our faith by throwing it “out there” to see where it will stick. We jump into verbal wrestling matches full of heated words but no warmth of voice tone or connection. Don’t get me wrong, internet relationships have connected me to some of the most precious souls I know. I’ve been inspired to think about things outside of my small sphere. There has been movement in my heart to connect to those near me in ways I hadn’t seen. I’ve been able to keep up with, pray for and encourage those I live far from but never wanted to lose. Sadly it’s done something else. It’s cluttered my brain. Back before digital cameras, I spent much more time setting up my shots. Taking fewer images because after all, it was expensive to develop and print. I never wanted to waste a chance at a great portrait. No one wanted to have to throw any away. As I snap away, filling up my cards with whatever comes through my lens, I take less care in the moment. I can’ always go back to manipulate the image, change the lighting, demolish red eyes or crop out superfluous back grounds. I’m finding hundreds of pictures that need to be deleted to enjoy the one or maybe two good pieces I can use. Like stray comments and discussions I can delete them. Once words are read, they can’t be deleted from the hearts of those who’ve read them. They take root in minds. They wound and divide and cause confusion. Unless we begin to plant words of grace and hope. Unless we sow what is meant to grow and inspire and teach we will only reap pain and division. Jesus, God incarnate, came to reconcile us to His Father and to each other. Pressed in by crowds, touching, being touched, weeping, healing, listening, speaking and loving. He could have just sent angels, you know, messengers of God. Meeting us in the flesh instead of merely in writing because He is personal that way. Here we are in this world, connecting through Facebook, Twitter, texting and blogs. We make announcements, share life events and sometimes we invite friends to join us in person. We warn of scams or mourn the passing of great leaders. As tragedies unfold our pages truly become newsfeeds. We no longer gather around flickering screen at a local cafe. We log on, throwing our status updates and pithy quotes out to the internet, hoping in some way to make sense or to feel less alone. The internet has become our town square, our coffee shop, a meeting place. For some it has become a place for fellowship. For many, it’s the only way they may ever hear about us. The truth is, very few will ever really know who we are. When grappling with an emotional topic one night, “friends of friends” chiming in, a real life friend of mine put it in perspective. She compared it to an open party where guests who aren’t invited show up. There is no relationship yet they drop in to argue. No context, no relationship and no real connection. They come only with a need to be heard or be right or both. I don’t want it to be that for me anymore. I’m tired of talking about being in relationships and not really living in them. I’m done with planning meals that no one shares. It is time to “do life” instead of planning it. It is time to touch, be touched where we can heal and be healed. Last year I chose the word “galvanize” for my One Word. It was better than a resolution because it wasn’t about one part of my life. It wove its way through all the places to inspire and incite for change. 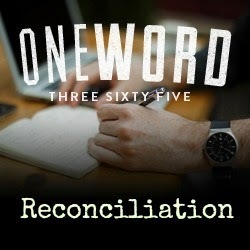 This year I have chosen the word “reconciliation”. A word that means to restore relationships, to repair connections and to grow friendships. After all, it is fulfilling the commandments Jesus said were most important. What word will you focus on this year? How about just today?